Today, 19 June, is Garfield The Cat Day. 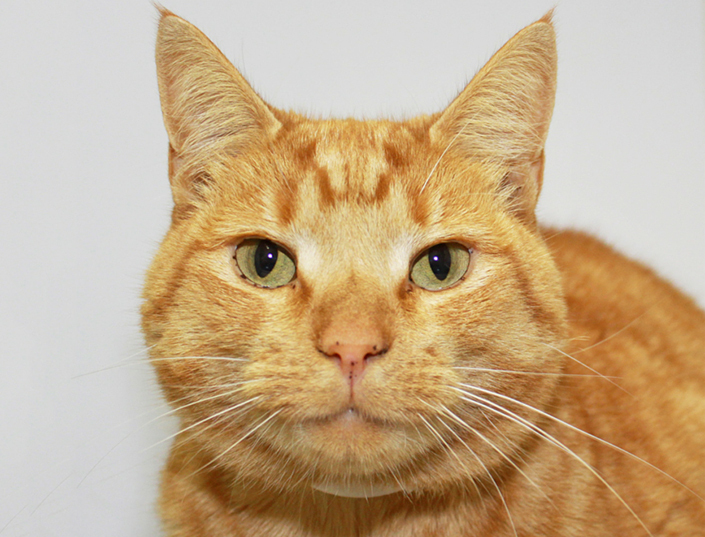 On this day last year, we introduced our Facebook followers to adoptable cat Garfield in the hope it would help him find a new home. Little did we know a loving family would spot his Facebook post and rush to our North Melbourne shelter to adopt him! 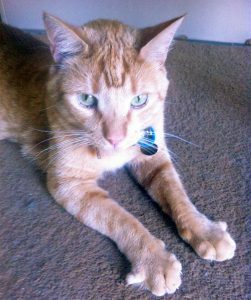 A year on, we checked in with Garfield’s new owner, Laura, to find out how the gentle giant had settled into his new home. Adopting an animal is the best thing you can do. There are so many gorgeous animals that need a second chance. We have always adopted our pets and it has been a wonderful experience. We love Garfield very much. 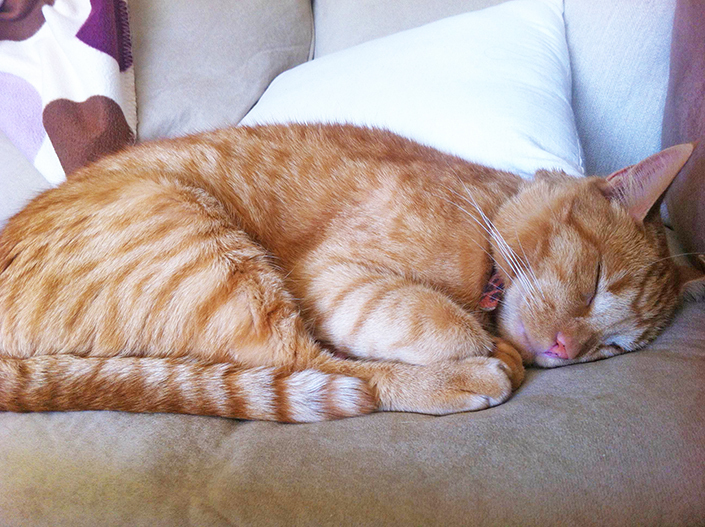 He loves to spend time with me throughout the day, sitting near me on the couch or under my feet on the floor. He particularly likes to sleep in my bed and will do everything in his power to encourage me to have an afternoon nap so he can snuggle close and give little kisses, gentle licks or head-butts, often purring his head off. Garfield isn’t a particularly active cat. He loves to lounge somewhere warm or snooze for hours on end in my bed. Garfield knows how to ask for food. Whilst vocalising that he wants some, he will run down to his food bowl trying to make you follow. If you don’t follow he will come back and vocalise again and try to make you follow him until he gets his little snack. We love Garfield’s sweet little face, his gentle meow and the cuddles he gives us in bed. Garfield loves beds, so he will meow gently at every door of the house hoping and pleading that someone will open the door and let him in. Garfield also loves when his dad comes home from work. He will sit on his dad’s lap to watch TV and give him kisses, licks and little head-butts. If dad will lay down on the bed to watch TV, Garfield enjoys this even more, often snuggling right up to him and going off to sleep. Looking to get a new cat? Garfield has found his forever home, but we have many other cats waiting to find theirs. Meet them today!